Hot tub poll results are in…. A hot tub can be a great addition to your static caravan or holiday lodge – but they’re not for everyone, and do need lots of looking after. 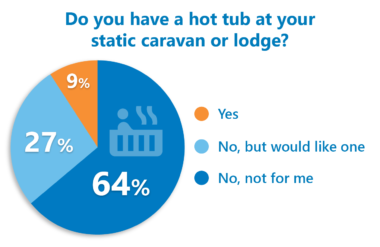 In last month’s community poll, we asked static caravan and lodge owners if they had a hot tub. Despite the growth in hot tub holidays, 64 per cent of our poll voters said a hot tub definitely wasn’t for them. However, more than a quarter of voters (27 per cent) said they didn’t have a hot tub but would like one at their holiday caravan. Only nine per cent of voters said they already had a hot tub at their static caravan or lodge. Val Pearce was concerned about the noise on her park. David Knowles isn’t a fan either: “Hot tubs require running 24 hours a day to avoid any build-up of listeria and legionnaires infections and most blow-up spas have the cheapest, noisy pumps and equipment, so are not a sociable item in any circumstances,” he commented. But Janice Jackson told us that she loves her blow-up hot tub. “Back from a cold day out boat fishing, or just star gazing at night, it’s a great way to get warm, relax, socialise with friends,” she said. If you’re one of the 27 per cent of voters who would like a hot tub then check out our gear guide here.